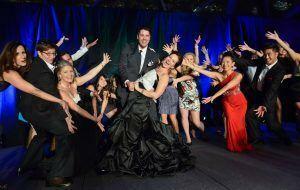 Amazing People Gala - Disco Inferno! Ready to have an AMAZING night? We are rolling out the red carpet & invite you to join our 4th Amazing People Gala, proudly sponsored by Accora Village. Fun is the name of this evening. With the Disco Inferno theme we encourage you to dust off your groovy powder blue tux & splashy cocktail dress....then get ready to rip up the dance floor! We kick off the evening with a VIP Reception where you can mix, meet & mingle with the Amazing People nominees. There will be live performances throughout dinner then , we will stop the disco ball to shine the spotlight on 40 Amazing People who have been nominated for the incredible work that they do in our community. Often their impact flies under the radar....not tonight as this gala shines the spotlight on them all night long. One person will be named the Amazing Person the Year as selected by our panel of judges. Ottawa is full of Amazing People! We've honoured over 120 Amazing People since we started 3 galas ago! We are thrilled that former Governor General Michaelle Jean and her husband Jean-Daniel Lafond will attend. They will be speaking about a the Michaelle Jean Foundation's major national initiative to promote diversity among 5 million Canadian young people in collaboration with 100 of Canada's leading women. This Gala is not to be missed. It is a tremendous networking opportunity with community minded people from all corners of our city. And you will be touched by the personal stories of the 40 Amazing People we will honour that evening.